YOLO | What Does YOLO Mean? YOLO (You Only Live Once) is typically used as a justification for taking a risk (e.g., doing a bungee jump), treating yourself to an extravagance (e.g., buying an expensive holiday), or doing something foolish (e.g., slamming back-to-back jaeger bombs). YOLO is often referred to as "carpe diem [Latin for 'seize the day'] for stupid people". Both YOLO and carpe diem imply you should enjoy life even if that means overriding common sense. I'm whacking the credit card and flying first class to Dubai YOLO. I'm going to jump on the stage when the security guard turns away. YOLO. 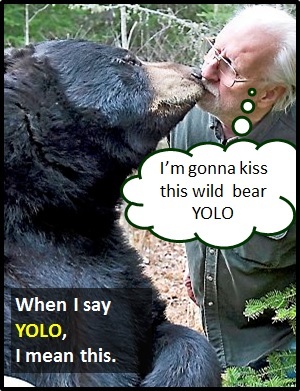 When YOLO is expanded to "You Only Live Once," it is a declarative sentence. However, it is most commonly used like an independent clause meaning "because you only live once," which serves as an adverb of reason. YOLO is an acronym (i.e., an abbreviation spoken like a word). Acronyms differ from initialism abbreviations, which are pronounced using their individual letters (e.g., UDI is pronounced "Yu Dee Aye").